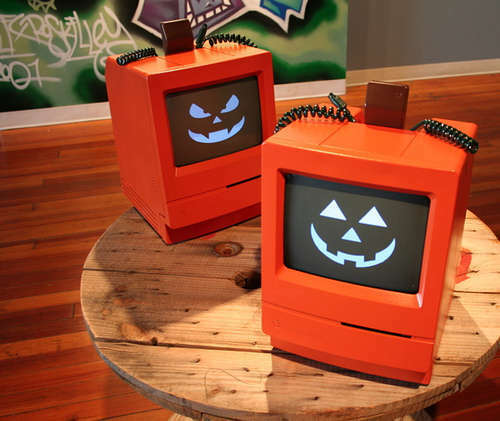 The mac-o-lantern thinks it has a little core duo heart <3. Hence, it acts just like a computer. It doesn’t have a button to turn it on, so you just need to give it a little shake, and a white light will turn on (simulating an apple computer when it turns on). Then it has a little mouse. When you move it around, it will find the spot and connect to the internet. Then, you need to click the button on the mouse, and it will download the Halloween software. When it finishes downloading… THEN the pumpkin will light on, and it will be ready to light up the night. After it’s on, when people walk in front of it, it flickers its eyes, trying to lure them with its affordance… just like a real apple computer would do. 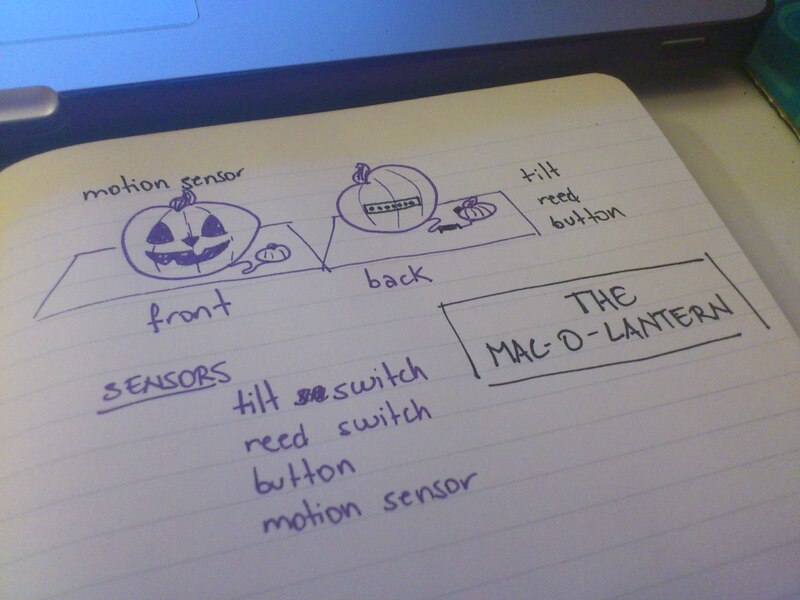 rough sketch of the mac-o-lantern. I really wanted to add sound to the project, but all the instructions for the Twig Sound Recorder were so confusing. I thought sound would really add up to the concept (with the sounds of turning on, connecting to the internet, finishing downloading the software), so it was difficult bringing it down to just lights. The code in general was also a bit tricky, since there’s a lot of if’s and a lot of led’s. HOWEVER, the tricky/difficult parts are also the most interesting ones! But the best part overall was coming up with a concept that both makes sense, and makes me happy.